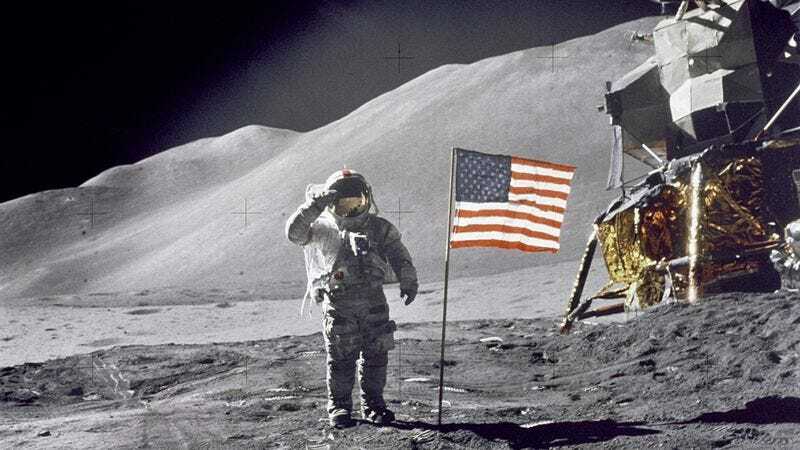 On July 20, 1969, Neil Armstrong and I made history by becoming the first human beings to walk on the moon. It was an incredible day, not just for Neil and myself, but for all mankind—a marriage of technology and human courage that I will always look back on and be proud of. And so today, as on every anniversary of the moon landing 45 years ago, my thoughts turn to that Apollo 11 mission and the horse that Neil Armstrong and I jettisoned out of the airlock on the way there. We pressed on, because if you have what it takes to fly hundreds of thousands of miles from Earth to the goddamned moon, you sure as hell can drag one screaming horse 10 feet to a spaceship’s airlock. So Neil and I got up, and we grabbed the horse, and we started dragging it toward the airlock. This was zero gravity, so all three of us—me, Neil, and the horse—were floating around during the whole thing, which made it easier to drag the horse across the Apollo 11 command module and toward the airlock. The horse was kicking his legs around, breaking a bunch of computer terminals and knocking things over, but Neil and I didn’t care. We pressed on, because if you have what it takes to fly hundreds of thousands of miles from Earth to the goddamned moon, you sure as hell can drag one screaming horse 10 feet to a spaceship’s airlock. Looking back on it, it was actually pretty easy. Now, 45 years later, I still think of that horse. I occasionally wonder if that horse’s lifeless body is still drifting across space, and I can’t help but think that, if there are truly lifeforms outside of Earth, what would happen if they ran across the body of a dead horse in space? There are some things we may never know.